Mudhras meaning signature, is an important aspect of musical compositions in Karnatic music. Composers have incorporated many types of Mudhras like Vaggeyakara Mudhra, Raga Mudhra, Tala Mudhra etc. in their compositions. Each composer has used a distinct name as his Mudhra and this offers interesting study and also indicates to the rasika who the composer of a particular song is. Dr.Radha Bhaskar made an interesting presentation on this subject for Rajalakshmi Fine Arts, Coimbatore on 20th February 2005 by taking a gamut of composers. She also demonstrated practically to show how the various Mudhras have been incorporated into compositions. This programme was well received by the rasikas of Coimbatore. As part of its 11th Pongal Festival in the year 2006, Bharathiya Vidya Bhavan, Coimbatore, organized a lec-dem on “Rasa in Trinity’s Compositions” by Dr.Radha Bhaskar. In this Dr.Radha explained the musical aspects of the compositions of Thyagaraja, Dikshitar and Shyama Sastri and illustrated the structure of each. She also sang a few songs and showed how each one’s compositions was distinct and unique. Many music lovers attended the programme. As part of its December Fine Arts festival 2006, Thyagar Brahma Gana Sabha in association with Mudhra organized a special programme “Navarathnangal” – featuring a tribute to nine salient composers of Karnatic music. The session highlighted the beauty of the compositions of Purandara Dasa, Thyagaraja, Dikshitar, Shyama Sastri, Swathi Thirunal, Koteeswara Iyer, Papanasam Sivan, Gopalakrishna Bharathi, Patnam Subramanya Iyer. A group of accomplished artists – Prema Rangarajan, sriram Gangadharan, Mohan Santhanam, Lakshmi Rangarajan, Visalkshi Nithyanand, G.Srinikanth and Shreyas Narayanan accompanied Radha on the vocal and Dr.Hemalatha and Ganapathi Raman accompanied on violin and mirudangam. As part of its December Fine Arts festival 2006, Thyagar Brahma Gana Sabha in association with Mudhra organized a special programme “Ariyakudi to Semmangudi” – a multimedia presentation on the contribution of the stalwarts – Ariyakudi Ramanuja Iyengar, Madurai Mani Iyer, M.D.Ramanathan, GN Balasubramaniam, Alathur Brothers, Chembai Vaidhyanatha Bhagavatar, Musiri Subramanya Iyer, M.L.Vasanthakumari, MS Subbulakshmi, Maharajapuram Santhanam. The programme was produced and presented by Dr.Radha Bhaskar and renowned musicologist Dr.SAK.Durga gave valuable inputs based on her rich experience. A unique feature of the programme was that the respective shishyas of these illustrious stalwarts were invited and honoured on the occasion. During the span of three hours, the listeners were transported to the golden era of Karnatic music and had the pleasure of listening to audio clippings of the masterpieces of these great musicians. Mudhra had a 12 months music appreciation programme in the year 2007 by Dr.Radha Bhaskar, wherein different topics were taken for presentation with a view to enlighten rasikas on various aspects of music. A lec-dem to highlight the beauty in Saint Thyagaraja’s compositions was presented by Dr.Radha Bhaskar at Infosys Hall in January 2007. In her presentation, Radha briefly sketched the biography of Thyagaraja and then explained in a detailed manner, the specialty in his compositions. She made special mention of how Thayagaraja gave life to many scales and made them alive as vibrant ragas, through his beautiful compositions. She highlighted how among the Trinity, Thyagaraja had singularly contributed to the raga Karaharapriya by composing many beautiful kritis in it. She was accompanied by Swarnalatha ( violin) and M.R.subramaniam (mrudangam). In the next session in February2007, the excellence of Dikshitar’s compositions was highlighted by Dr.Radha Bhaskar. She explained the contribution of Dikshitar in giving shape to many rare ragas and how distinct and different his style of composing was compared to the other Trinity, both in form and content. Radha demonstrated many of Dikshitar;’s kritis and the audience had an enlightened session. This session by Dr.Radha Bhaskar featured the classic compositions of Shyama Sastri. A power point presentation summarized his contribution to music and the ragas exclusively used by Sastri to compose kritis. The compositional pattern and types as different from Tyagaraja and Dikshitar was well illustrated and demonstrated. The swarajathis which are monumental and exclusive contributions of Shyama Sastri were sung and their structure explained. Papanasam Sivan is hailed as Tamil Thyagaraja as he was greatly influenced by Thyagaraja in composing songs. He also imbibed the best of the other two Trinity and evolved a unique style which made his compositions very popular. Sivan chose Tamil and Sanskrit as his medium of expression and his simple and catchy tunes gave unique shape to many ragas. Dr.Radha Bhaskar explained all these interesting aspects of Sivan’s compositions and sang many popular as well as rare kritis of Sivan. She made special mention of the number of kritis Sivan had composed, next to Thyagaraja and how they were different from Thyagaraja’s conceptualization of the raga. This was a one of its kind event held at Bharathiya Vidya Bhavan, Chennai. Though the programme was scheduled at 6p.m, right from 4.30 p.m, rasikas thronged the hall and when th eprogramme began, the hall was overflowing with audience also standing in the corners to get a glimpse of the event. The programme featured 15 stalwart musicians of the golden era of music – Ariyakudi Ramanuja Iyengar, Madurai Mani Iyer, M.D.Ramanathan, GN Balasubramaniam, Alathur Brothers, Chembai Vaidhyanatha Bhagavatar, Maharajapuram Viswanatha Iyer, Musiri Subramanya Iyer, M.L.Vasanthakumari, MS Subbulakshmi, D.K.Jayaraman, Maharajapuram Santhanam and had power point presentation, audio and video clippings and expert comments by world renowned musicologist Dr.S.A.K.Durga. The function was presided by Dr.Nalli Kuppuswamy Chetti and A.Natarajan and R.Krishnaswamy were the chief guest. Many eminent personalities including Dr.Padma Subramanyam, Mrs.YGParthasarathy, L.Sabaetnam, T.V.Gopalakrishnan and others graced the occasion. Just as we recognize and appreciate ragas, it is also important to understand the variety in compositional structure as conceived by various composers. Karnatic music has a variety fare of musical forms – varnam, kriti, padam, javali, tilan, tiruppugazg, ashtapadi, tarangam etc and each has a unique form. Also, though many vaggeyakaras have composed kritis, each composer has adopted a distinct style and understanding them will enhance our appreciation level. This was the subject taken up by Dr.Radha Bhaskar where she illustrated the different compositional forms and explained their form and content. 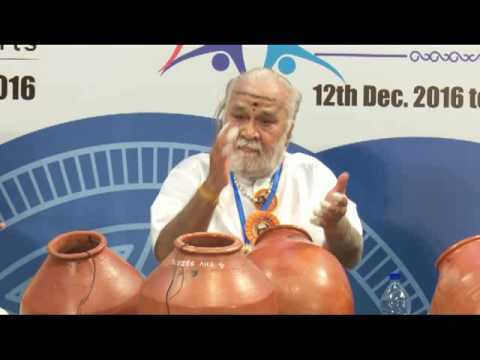 This session highlighted the creative elements in Karnatic music like raga alapana, tanam, niraval and swaram.Dr.Radha, along with noted vocalist T.V.Ramprasadh and Meera Sivaramakrishnan ( violin) and Melakkaveri Balaji (mrudangam), explained the structure of various manodharma forms. Ramprasadh also sang a ragam tanam pallavi, which is the crowning glory of Karnatic music. An interactive session precede where rasikas asked questions related to music and they were suitably answered by Mudhra Bhaskar & Radha. Apart from the Trinity, there have been many composers in Tamil who have enriched Karnatic music. These include the composers like Arunagirinadhar, Appar Sundarar, Sambandar, Andal, Neelakanta Sivan, Gopalakrishna Bharathi, Arunachala Kavirayar, Periasami Thooran, Papanasam Sivan, Koteeswara Iyer and others. In her presentation, Dr.Radha Bhaskar outlined the contribution of these great composers and how they have enriched our music through their inimitable compositions. If Karnatic concerts today are rich in its content, it is mainly because of the beautiful compositions of the Trinity namely, Thyagaraja, Dikshitar and Shyama Sastri who have made a monumental contribution. Many scales came alive as ragas through their beautiful compositions. They also offer a variety fare in terms of raga, tala, kalapramana, eduppu, structure etc and through a comparative study, these aspects were explained by Dr.Radha Bhaskar in her presentation “Trimurthy Vaibhavam” organized during Mudhra’s 13th Fine arts festival on 11th December 2007. Appropriate demonstrations by Radha, Prema Rangarajan, Uma & Geetha with the accompaniment of Srividhya Iyer ( violin) and Sharan Shivakumar ( mrudangam) made the presentation wholesome. The rasikas were also enlightened about the salient features and distinct style of each composer so that they could appreciate it better. This programme was earlier held in Bharathiya Vidya Bhavan and due to tremendous public demand, it was screened yet again on 19th December 2007 at Infosys hall, T.Nagar. The programme featured 15 stalwart musicians of the golden era of music – Ariyakudi Ramanuja Iyengar, Madurai Mani Iyer, M.D.Ramanathan, GN Balasubramaniam, Alathur Brothers, Chembai Vaidhyanatha Bhagavatar, Maharajapuram Viswanatha Iyer, Musiri Subramanya Iyer, M.L.Vasanthakumari, MS Subbulakshmi, D.K.Jayaraman, Maharajapuram Santhanam and had power point presentation, audio and video clippings and expert comments by world renowned musicologist Dr.S.A.K.Durga. As part of its Pongal Music Festival, Bharathiya Vidya Bhavan, Coimbatore organized a presentation on Tamil Composres by Dr.Radha Bhaskar. She covered a whole gamut of composers from Andal to Rukmini Ramani (daughter of Papanasam Sivan) in January 2007. In her presentation, Radha highlighted the contribution of each Tamil composer with special focus on Papanasam Sivan who has enriched Karnatic music with a wide variety of songs on various deities. She also highlighted the marathon contribution of Koteeswra Iyer in composing kritis in Tamil on Lord Muruga in all the 72 melakarthas. She rounded off with the contemporary composers lalgudi Jayaraman and Rukmini Ramani’s compositions. In the 14th Fine arts festival of Mudhra, Saptharathnangal, a fitting musical tribute to seven salient composers of Karnatic music was presented by Dr.Radha Baskar. The session highlighted the beauty of the compositions of Thyagaraja, Dikshitar, Shyama Sastri, Swathi Thirunal, Koteeswara Iyer, Papanasam Sivan, Gopalakrishna Bharathi. The participants besides Dr.Radha, included R.Suryaprakash, Mohan Santhanam, Sreyas Narayanan, Prathna, Vidya Kalyanaraman, Vasuda Ravi . They were accompanied by Kovai Chandran, Mudhra Bhaskar and H.Sivaramakrishnan. Ragas is the most important pillar of Karnatic music and all compositions as well as improvisations are based on ragas. 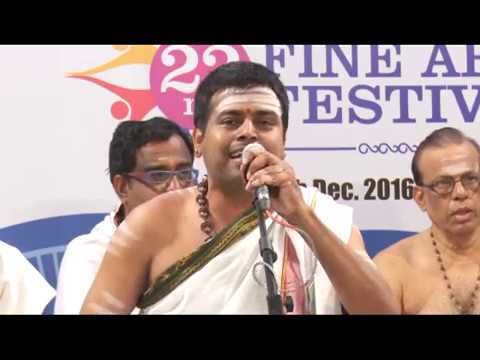 Karnatic music can be enjoyed better by rasikas if they understand the beauty of ragas, how they are formed and how the raga system is structured. It is with this focus that the programme was conducted to an enthusiastic audience. Ragas of various categories and types were taken for study and suitably demonstrated by Dr.Radha Bhaskar. In association with Narada Gana Sabha, Mudhra conducted a Music Appreciation programme on “Karnatic concert – form and content ” by Dr.Radha Bhaskar. R.Krishnaswamy presided and on the occasion, a music book on “Post Trinity ragas” written by Dr.M.B.Vedavalli was also released. Dr.Radha explained how the Karnatic concert is structured and how it is developed from varnam to tillana. She explained how Kalpita Sangitam and Manodharma sangitam are perfectly balanced and presented in a concert.Radha was accompanied by Kovai Chandran and Mudhra Bhaskar. Mudhra in association with Kartik Fine arts conducted its Music appreciation programme on the topic “Beauty of kritis in Karnatic music” by Dr.Radha Bhaskar. 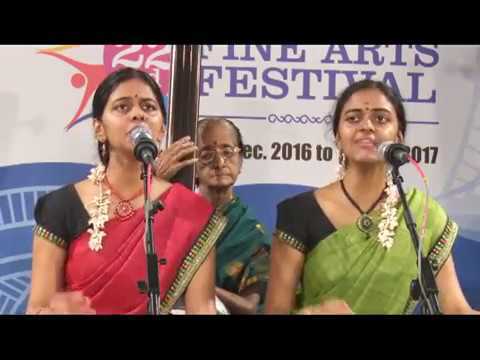 Kritis formthe core content of Karnatic concerts and offer great variety in form and structure. The different kritis as composed by various composers and how they differed from one another was highlighted. Practical examples enhanced the presentation. Mudhra offer an interesting study and vaggeyakaras have used different Mudhras by which we can identify their compositions. Mudhras meaning signature, is an important aspect of musical compositions in Karnatic music. Composers have incorporated many types of Mudhras like Vaggeyakara Mudhra, Raga Mudhra, Tala Mudhra etc. in their compositions. Each composer has used a distinct name as his Mudhra and this offers interesting study and also indicates to the rasika who the composer of a particular song is. Dr.Radha Bhaskar made an interesting presentation on this subject. She also demonstrated practically to show how the various Mudhras have been incorporated into compositions. Karnatic music abounds in compositional forms like varnams, kirtanai, kriti, tillana, javali, ashtapadi, tarangam, tiruppugazh, Each form is distinct and has its own unique structure. With the help of power point presentation and practical demonstrations, Dr.Radha Bhaskar explained the compositional forms. Sundaram Motors organized a Music appreciation programme for its employees with a view to motivate them into listening to music. Dr.Radha Bhaskar spoke about the purpose of music in our life and society, how music is in itself a language, the different genres of music and many such interesting topics. She sang many songs from different genres like folk, devotional, film and classical music and enthralled the audience. Karnatic concerts today is rich in its content, mainly because of the beautiful compositions of the Trinity namely, Thyagaraja, Dikshitar and Shyama Sastri who have made a monumental contribution. Many scales have come alive as ragas and got a concrete structure through their beautiful compositions. They also offer a variety fare in terms of raga, tala, kalapramana, eduppu, structure etc and through a comparative study, these aspects were explained by Dr.Radha Bhaskar in her presentation “Trimurthy Vaibhavam” for Mylapore Fine Arts. She also sang many gem kritis of the Trinity which greatly enhanced the presentation. Just as we recognize and appreciate ragas, it is also important to understand the variety in compositional structure as conceived by various composers. Karnatic music has a variety fare of musical forms – varnam, kriti, padam, javali, tilan, tiruppugazg, ashtapadi, tarangam etc and each has a unique form. Also, though many vaggeyakaras have composed kritis, each composer has adopted a distinct style and understanding them will enhance our appreciation level. This was the subject taken up by Dr.Radha Bhaskar in her presentation for Saraswathi Vaggeyakara Trust at Tambaram, where she illustrated the different compositional forms and explained their form and content. One of the most gratifying experience for a rasika is to be able to identify the raga that the main artist is performing in a concert. These ragas are identified through constant hearing but there are certain key phrases for every raga which give it its distinct flavor. If rasikas get to know these key phrases, they can identify ragas easily. It was with this focus that Mudhra organized an interactive session by noted musician O.S.Thyagarajan and Dr.Radha Bhaskar. Ragas from various categories like Rakthi ragas, vakra ragas, vivadi ragas etc. were taken and suitably illustrated. The hall -packed audience felt thrilled to hear many popular compositions sung beautifully by Thyagarajan and also his experience- filled explanations. Dr.Radha Bhaskar began her presentation by explaining what a raga is, how it is formed and how gamakas play a vital role in establishing each raga. She took up a few selected ragas like Dhanyasi, Sahana, Chalanata, Saveri, Ritigowla, Varali, Surutti, Pasupathipriya,Kuntalavarali and Behag and explained their structure with suitable examples. Radha had vocal support from Aiswarya Shankar & KP Nandini and the accompanists were Melakkaveri Thyagarajan, Nellai Balaji, H.Sivaramakrishnan. Dr.Radha Bhaskar gave an enlightening lec-dem for Sri Rama Lalithakala Mandira, Bangalore on 14th May,2010. Radha began by explaining the rationale for such a lecture –– how a music-appreciation course enriches a listener and also helps performers by creating enlightened audiences. She went on to place Carnatic music within the context of music worldwide. She also explained the salient features of carnatic music and demonstrated it suitably through practical demonstrations. Music Appreciation Programme,, a 12 months series in coordination with Bharathiya Vidya Bhavan Padmashri Dr.Nalli Kuppuswami Chetti on 31st July 2010 . The first topic taken for presentation was – “How to Identify Ragas” The 12 months topics included Identifying ragas, Identifying ragas – 2, Compositional forms , Beauty of kritis, Thyagaraja, Mudhras, manodharma sangeetam etc. If Karnatic concerts today are rich in its content, it is mainly because of the beautiful compositions of the Trinity namely, Thyagaraja, Dikshitar and Shyama Sastri who have made a monumental contribution. Many scales came alive as ragas through their beautiful compositions. They also offer a variety fare in terms of raga, tala, kalapramana, eduppu, structure etc and through a comparative study, these aspects were explained by Dr.Radha Bhaskar in her presentation “Trimurthy Vaibhavam” organized by the Visaka Cultural academy, Visakapatnam. The programme was presided by maestro Nedunuri Krishnamurthy who blessed Dr.Radha and appreciated her efforts. This was a programme by Dr.Radha Bhaskar during Mudhra’s 16th Fine arts festival on 29th December 2010, highlighting various ragas and making rasikas understand them through compositions and key phrases. 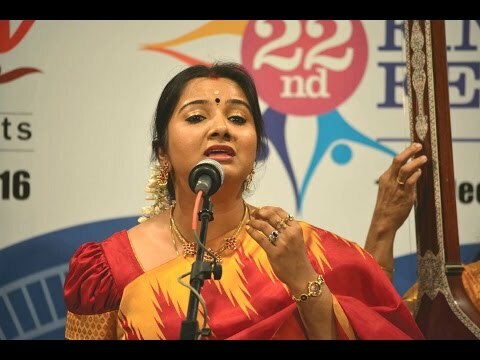 She had vocal support from Aiswarya Shankar & KP Nandini and Melakkaveri Thyagarajan ( violin), Nellai balaji ( mrudnagam) and H.Sivaramakrishnan ( ghatam). This was a unique interactive programme by O.S.Thyagarajan and Dr.Radha Bhaskar wherein not only tips were given about enjoying and identifying ragas but also Thyagarajan explained how each of the stalwarts rendered specific ragas and how certain ragas became their hallmark. His personal experiences and anecdote made the presentation very interesting. A question-answer session with rasikas also followed. 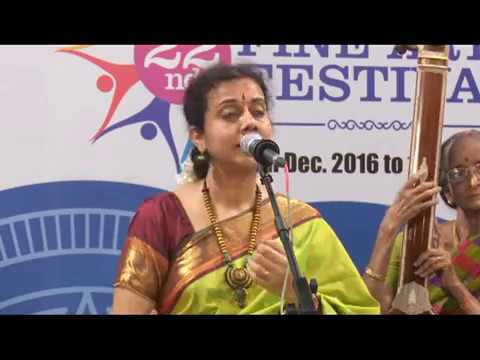 In this programme for Mudhra’s 17th Fine arts festival, Dr.Radha Bhaskar selected a few ragas of different varieties and explained their structure through key phrases. Vocal support was provided by Aiswarya Shankar and KP Nandini. Ramaiah Vittal (mridangam) and Nanganallur Swaminathan (ghatam) provided the vital rhythmic support. The joy of understanding ragas and experiencing its beauty was highlighted through a scholarly presentation by Dr.radha Bhaskar with KP Nandini, Aiswarya Shankar, Anayampatti Venkatsubramaniam ( violin) and Mudhra Bhaskar ( mrudangam). With a view to enlighten the Karnatic music lovers, a Music Appreciation Programme was organized at Singapore by Dr.Radha Bhaskar. The event had very earnest rasikas who were keen to know more about Karnatic music. Dr.radha, in a simple and lucid style illustrated the definition of music, its connection with our society and culture, music as a language in itself, different forms of music like folk, devotional, film and classical and then went on to xcplain the salient features of Karnatic music. An interactive session followed where the audience asked pertinent questions which were suitably answered by Dr.Radha. Vandana & R.Gopalakrishnan, who are themselves avid music lovers, oganised the event in a very meticulous manner. Mudhra Bhaskar coordinated the whole event. In the 17th Fine arts festival of Mudhra, Saptharathnangal, a fitting musical tribute to seven salient composers of Karnatic music was presented by Dr.Radha Baskar. The session highlighted the beauty of the compositions of Thyagaraja, Dikshitar, Shyama Sastri, Swathi Thirunal, Koteeswara Iyer, Papanasam Sivan, Gopalakrishna Bharathi. The participants besides Dr.Radha were Vasuda Ravi, KP Nandini, Aiswarya Shankar & Dikshita. They were accompanied by Anayampatti Venkatsubramaniam, Nellai Balaji and Krishna (ghatam).